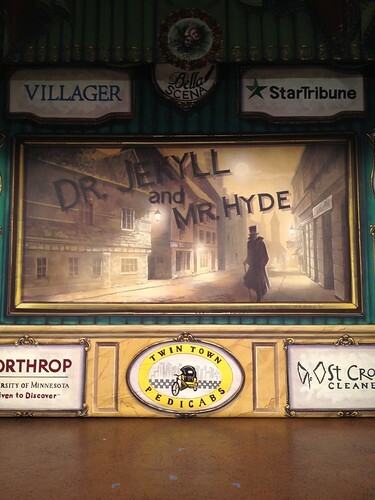 Last night we went to Doctor Jekyll and Mr. Hyde at the Showboat near Harriet Island in St. Paul. It was the opening night of the show, put on by University of Minnesota students. 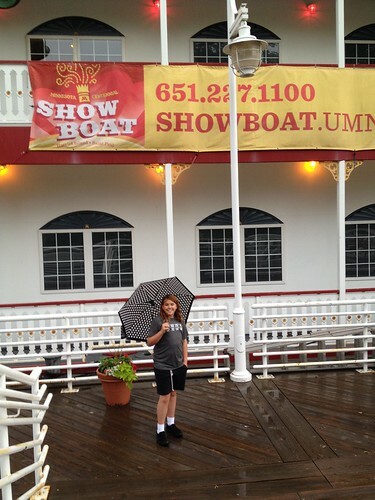 My wife and I had been to the showboat before, to see Dracula but I believe our last visit was in something like 1992, before we were married. 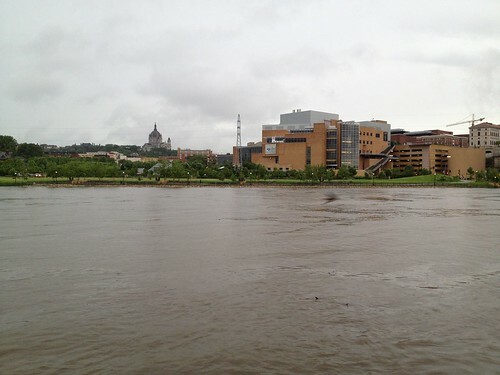 We both remember it being closer to the Minneapolis campus and infested with spiders. Jekyll and Hyde was performed as a melodrama with olios inbetween. I'd never heard of an olio, but was pleasantly surprised. They were hilarious. The show itself was full of great humor, but the olios really stole the show and "The Calendar Parade" and "The Saga of Two Little Sausages" had me laughing. All of them were amusing. I highly recommend the show, but after their opening night they're on hiatus for nine days while the Mississippi River crests. 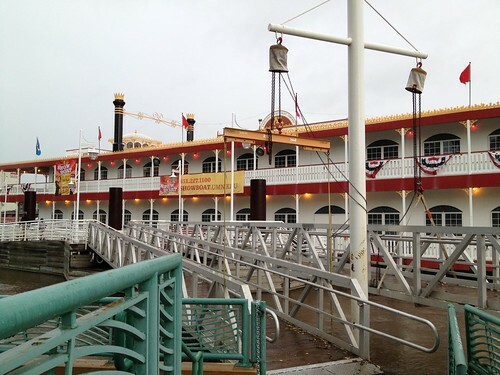 I was joking with Kyle on Facebook that I sort of felt like I was in Bioshock Infinite. There was even a barbershop quartet as part of the olio "Marriage a Cinq" He said if I had to throw a ball at a minority I should get out my skyhook and go to town. This view, more than most, made me think of Bioshock. 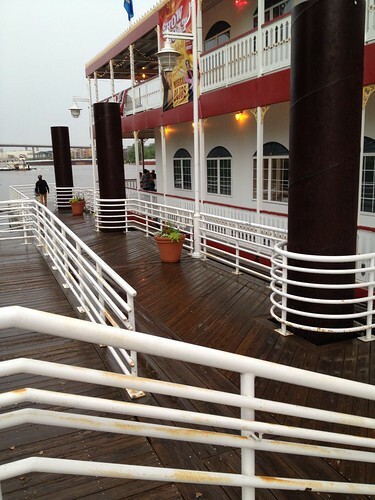 It's like all the empty decks where you're looking for trashcans to pilfer. Panorama of the river. The water was speeding along. At one point, just as it was getting dark, a large tree was going past me as I was standing at the rail, with a noise that sounded like a monster had breeched, the whole thing sudden vanished. A few minutes later, one limb popped back up above the water. I would not want to be in the water right now, or in the next week as it crests. It's a little less Bioshock when Eryn is posing with her umbrella, although if she'd had a dress and could manipulate dimensional barriers, it might have been a different story. 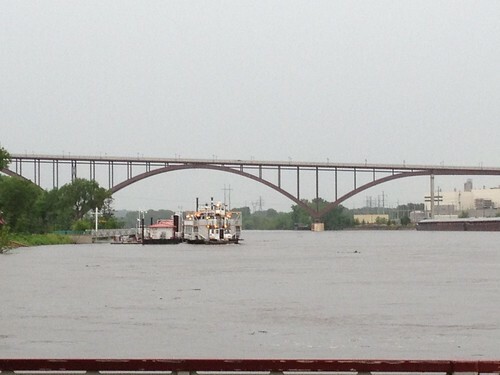 Nice picture from the showboat of downtown St. Paul. 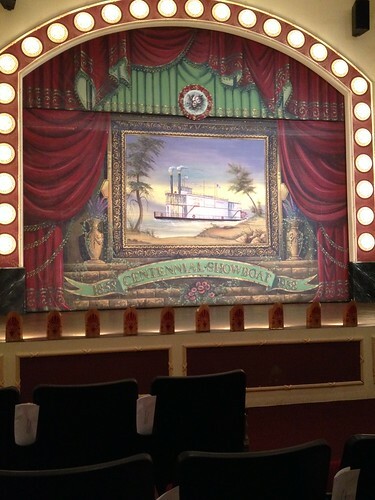 The stage before the show. Almost all the scenery was painted. There were amusing scenes where someone would pretend like a painting was a 3-dimensional prop. Intermission. 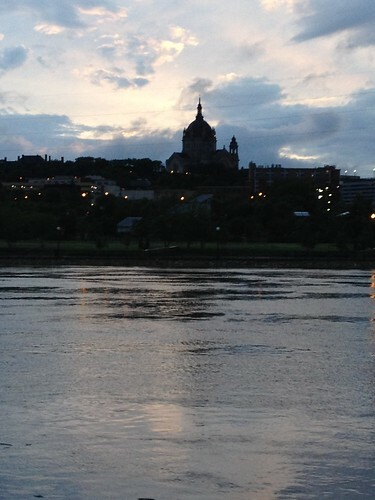 The cathedral in the dark from the showboat. There were a number of informational displays about Jekyll and Hyde. One was about how Hyde was portrayed through the years. 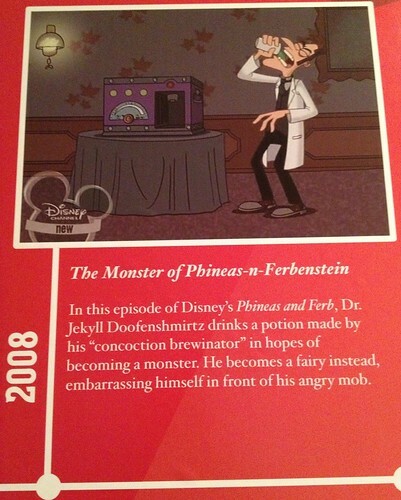 It included Doofenshmirtz's failed attempt to make himself a monster. The title painting which came down between scenes and after the Monty Python-esque ending. Wonderful vaudeville and a lot of energy.